Special Containment Procedures: (Former. SCP-2282 is now deceased.) SCP-2282 is to be kept under the care of the Area-12 Parazoology Department in an outdoor enclosure. SCP-2282 should never come closer than a distance of one hundred meters (100 m) to any structure or tree. SCP-2282 is to have appropriate maintenance for a domestic goat. Description: SCP-2282 is a female young mammal of a unique subspecies closely related to Capra aegagrus hircus, classified as C. a. spatium. SCP-2282 is of normal size and externally identical to a common domesticated goat. SCP-2282's skeletal, muscular, and cranial anatomy is identical. SCP-2282's digestive tract is a highly non-Euclidean array of spacial distortions warped to increase its internal volume to at least seventeen thousand cubic meters (17,000 m³), consisting of over eight thousand (8000) separate stomachs. The digestive tract of SCP-2282 is complicated and nonlinear with seemingly no organized purpose. 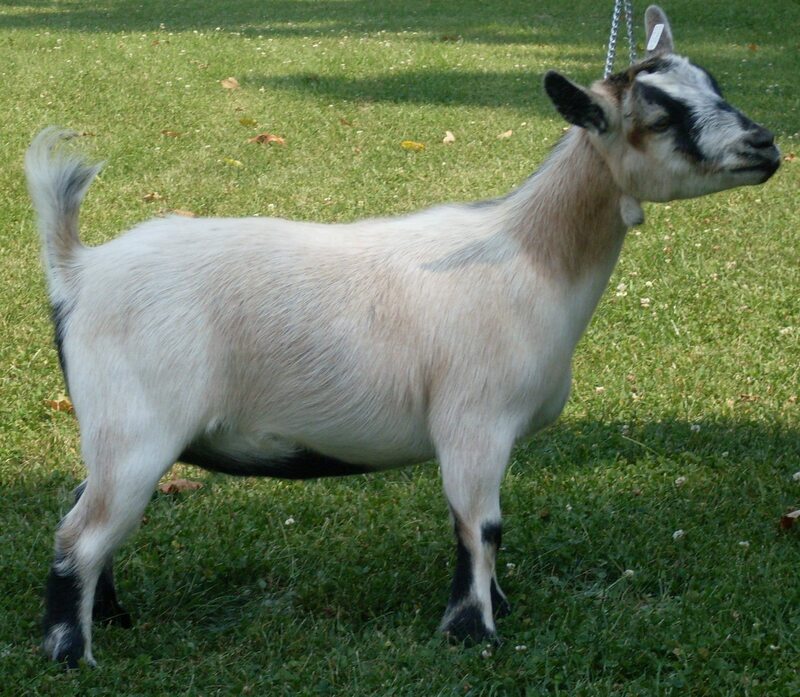 The total mass of SCP-2282 is at least sixteen million kilograms (16,000,000 kg), but externally appears to have a mass of only 89 kg, a normal amount for a goat of its apparent breed. These additional organs also apparently do not require additional sustenance to function, as SCP-2282's material diet is normal. SCP-2282 consumes matter by incorporating the space that contains that matter into its own body. This space is removed from an area near SCP-2282's mouth while grazing, and manipulated so that its exterior is shrunk as it is transported to inside of SCP-2282's digestive tract. The cavity this creates within SCP-2282 is then filled with new flesh and organs. SCP-2282 consumes approximately three cubic meters (3 m³) per day. Addendum: SCP-2282 was discovered on 3 Feb 2001 on a goat ranch in central California after Foundation gravitational-wave observatories in Area-6, Area-22, and Site-20 began detecting a small, regular tremor in the curvature of spacetime. The anomaly was triangulated, and the farm was investigated and purchased after the effect was confirmed. 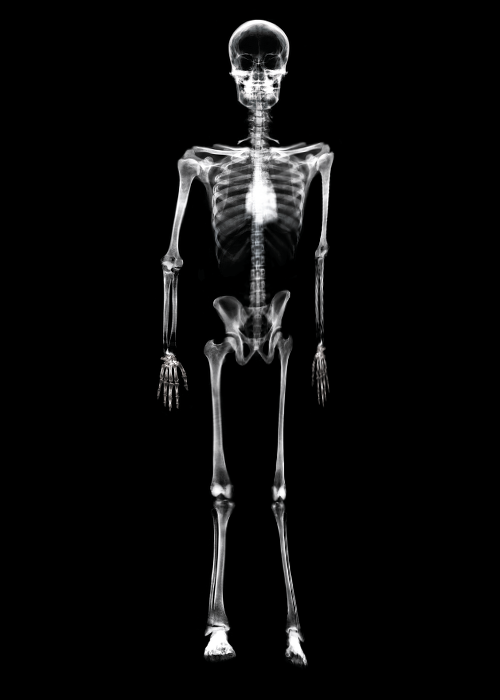 X-ray of Dr. Jept's skeleton after distortion. Dr. Jept was standing sixty meters away with SCP-2282 to his left. Addendum: Euthanasia of SCP-2282 proceeded as planned until the moment of death. After injection by Dr. Dangson, SCP-2282's interior instantaneously distorted itself to match Euclidean space. This resulted in a bubble of new space sixty-seven meters (67 m) in diameter appearing from SCP-2282's abdomen, warping all space in the surrounding area. Dr. Dangson, standing directly next to SCP-2282 during the distortion, was killed instantaneously from massive anatomical deformation. Dr. Carrs entered critical condition and died six hours later from cerebral hemorrhaging. Dr. Ohman and Dr. Jept suffered severe skeletal and anatomical deformation; Dr. Jept required amputation of his left arm and leg, and Dr. Ohman is currently undergoing intensive physical therapy to regain full mobility. The sphere of new space was filled with goat entrails which immediately collapsed to fill the dimple in the ground created by the distortion and overflow into the surrounding area.